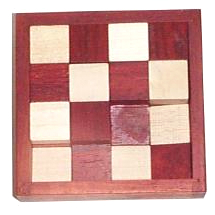 Place the wooden pieces into the box. Just Fit is designed by William Strijbos and won first price in the 1990 Hikimi Puzzle Competition (competition for wooden made puzzles only). This product was added to our catalog on 03.12.2008.